Experience the serenity and beauty of the Alaskan wilderness as you explore secluded coves and rainforest-clad islands by boat and then sea kayak bountiful Alaskan waters on the four-hour Orcas Cove Kayak tour! Cruise along Ketchikan Creek to Saxman Totem Park and Mountain Point on the way out to Orcas Cove, where you’ll move from boat to sea kayak for a leisurely paddle along the shoreline with the possibility of spotting humpback whales, bald eagles, porpoises, seals, and sea lions, as well as deer, mink, river otters, and possibly even black bears! Slow down to enjoy a peaceful paddle, accompanied by the sounds of birds singing in the rainforest and the salty smell of the delicate intertidal ecosystem. Many travelers say this is one of the best Ketchikan excursions for the whole family, adding that one highlight is the delicious smoked silver salmon picnic and hot drinks served aboard a floating Orcas Cove base at the conclusion of the sea kayak adventure! 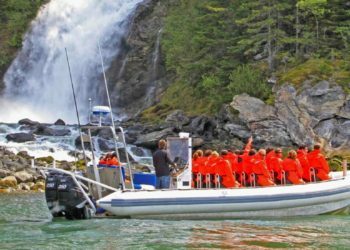 One of the top Ketchikan excursions for nature-lovers, the Orcas Cove adventure puts you up close and personal with scenic Alaskan wilderness. The Orcas Cove Kayak experience is suitable for both beginners and serious paddlers. All equipment is provided, including weatherproof outerwear and dry bags to protect your camera, binoculars, video recorder, and other personal items. Your small group of no more than 12 people meets at the cruise dock to board a comfortable cruise boat for the 20-minute ride out to Orcas Cove, the launching point for an hour and a half paddle that will be followed by a delicious picnic in this beautiful wilderness setting. As you savor the peace and tranquility of your Orcas Cove Kayak adventure, your naturalist guide, who has led countless Ketchikan excursions, will share his or her knowledge of the local environment, adding a layer of newfound knowledge to the excitement you’ll feel if and when you encounter stunning Alaskan wildlife! Note: If you’re looking for a somewhat shorter kayak trip or are a bit more price-conscious, you may want to check out the Ketchikan Sea Kayak. This moderate activity is suitable for children ages 6 and older. No previous kayaking experience is necessary, and you'll be equipped with all the gear and info you need for this gentle activity., To safely participate, guests must be able to fit into a spray skirt that is 55 inches around the chest and stomach area and be able to sit in a kayak seat that is 18 inches wide., Specially adapted kayaks are available for guests over 6’3”. Please let us know if one is required for your group. How long is this excursion, and is transportation included? Answer: The total duration of this activity is about 2.5 hours with about 1.5 hours on the water. The meeting location will be just next to the Ketchikan Visitor's Bureau, which is conveniently situated very close to the cruise docks. A representative will meet you there, and the kayak base is just a short walk away. Of course, you'll receive detailed meeting instructions and planning information in a confirmation email upon booking. Do I need previous experience? Is kayaking safe? Answer: This tour is a great entry-level kayaking tour and perfect for first-timers or those with experience. The kayaks used for this tour are large, 2-person kayaks that are quite stable. Alaska's Inside Passage is scattered with nearby islands which provide calmer, bay-like conditions for the paddle (this isn't on the open ocean). First time jitters are common, but the small-group setting means you'll have lots of personal attention from the accompanying guide. What should I wear and how to prepare for this tour? Answer: You should not need to bring any special clothing or shoes for kayaking. We provide paddle jackets and pants for our guests and have poggies to keep your hands warm on cold days. Even in the summer, we wear 2 layers on most days. Please wear 1 or 2 layers under your coat (on chilly days) as it is best to have a layer or 2 under our paddle jacket. Fleece, wool and technical fabrics are ideal, but jeans or sweatpants and a sweatshirt will work just fine. On cold or rainy days, it is a good idea to pack a warm hat, gloves and an extra layer to put on after you kayak. A baseball cap is helpful on both sunny and rainy days. Despite Ketchikan’s reputation for rain, there are many days when sunglasses and sunscreen are needed on the water. Sneakers, sport sandals or rubber boots are the best shoes for kayaking: your feet will not get wet. Hiking boots can be too bulky to fit in the kayak and make it difficult to use the rudders. Answer: Absolutely! There are dry bags of several different sizes to accommodate cameras, binoculars and any other items you would like to bring on the kayaks with you. Waterproof cameras are great but don't be afraid to bring a good digital SLR camera and put it in one of our dry bags. There are plenty of opportunities for photography and you don't want to miss an amazing shot. Can Grandma come along too? Answer: You are never too old to paddle a kayak. Our oldest participant to date was age 90 and going strong. We use double kayaks to pair people up to make strong paddling teams. Just be aware that kayaking does require some physical exertion, and for the Orcas Cove trip, we have to "climb" aboard the mother ship. Please call or email us if you have any questions or concerns. What if it rains? Do the trips get canceled? Answer: Ketchikan is in the heart of a temperate rainforest, and we would never do anything if we stopped for the rain. Please do not let the possibility of rain deter you from booking. Southeast Alaska is at its most beautiful on misty rainy days. You'll receive quality paddling jackets, waterproof pants and spray skirts to keep everyone as dry as possible. And don't forget that the wildlife doesn't care about the rain. Of a greater concern to kayakers is strong wind, and if the conditions are unsafe, we will cancel trips with a full refund. Is there a weight limit for the kayaks? Answer: Over the years, we have seen all shapes and sizes! We do not have a set weight limit as the ability to participate depends on size rather than weight. To fit into our kayaks, you must be able to step into a 55" spray- skirt tube and pull it up to your chest: if your girth is greater than 55", you will not be able to participate safely. If you are not sure whether you will be able to participate, please call us for more information.